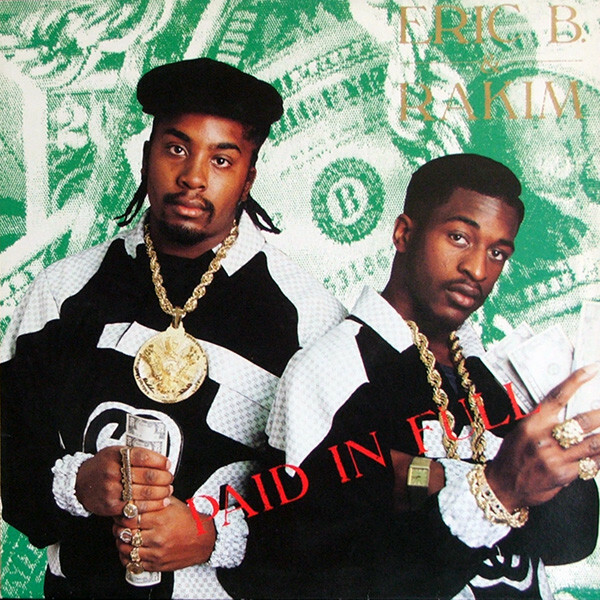 It has been twenty-five years since Eric B & Rakim released their debut, Paid in Full, on July 7, 1987, so it’s easy to forget what a significant achievement it was. That year, hip-hop producers like Rick Rubin, Marley Marl (MC Shan, Roxanne Shante), the Bomb Squad (Public Enemy) and Teddy Riley (Kool Moe Dee) had just begun to harness the essential elements of sampling. They used bits and pieces from classic soul, funk and rock, then hid them amidst hard, bludgeoning, TR-808 drum machine tracks – often referred to as the Def Beat – and noisy scratching. Paid In Full was the first album to not only appropriate old records like Bobby Byrd’s “I Know You Got Soul” and the JBs’ “Pass the Peas,” but to lift the swinging tempos, too. It marked a transition from the Def Beat era of omnipresent drum beats and towards a lighter, funkier rhythm. Eric B.’s beats on Paid in Full, particularly the classic single “I Know You Got Soul,” was the catalyst. This brand new funk not only created the hip-hop’s first real golden age, but its ripple effects could also be felt in alternative-rock bands like R.E.M., Siouxsie & the Banshees and the Cure, and pop artists like Paula Abdul and Madonna. The golden era concurred with the rise of New Jack Swing in R&B, and the two paths are linked: Teddy Riley, the creator of New Jack Swing, established himself working with rappers like Kool Moe Dee’s (How You Like Me Now) and Heavy D. & the Boyz (Living Large). The difference is that Riley wanted to play funk using the latest synthesizer technology. Rap producers chopped and looped samples from the original records, creating something that sounded both timeless and new. It was during this period that James Brown became one of the most sampled artists in history. With over 100 albums as a solo artist and producer and hundreds of 7-inch singles, and a catalog that spanned four decades of funky soul, Brown was fertile territory for a generation learning the art of crate digging, and finding the most arcane, obscure gems. But one Brown sound stood out from the others: “Funky Drummer,” a 7-inch single that featured a drum solo by then-JBs drummer Clyde Stubblefield. His drum break was used on nearly every major hip-hop album released from 1988 to 1990. (It wasn’t on Paid in Full, but it was on Eric B. & Rakim’s second album, Follow the Leader.) Most famously, the Bomb Squad used it for several tracks on Public Enemy’s seminal It Takes a Nation of Millions to Hold Us Back. On “Security of the First World,” the crew didn’t even bother to add a melody or turntable scratching to the Funky Drummer break. They simply looped it so it snapped back and forth, like an eternal rhythm. Brown himself was nonplussed by the attention. On the title track from his 1988 Full Force-produced comeback I’m Real, he snarled, “Stop sampling me on your records ‘til I’m paid in full.” But it wasn’t just a flood of lawsuits and copyright claims that snuffed out the golden age of rap. When hip-hop culture evolved into new trends, from the jazz-rap period of the early 90s to the luxury rap/”yacht rap” fad of today, the “Funky Drummer” break became a hallmark of a particular era that is now considered old-school. Still, it’s worth remembering the momentous impact “Funky Drummer” has had. This cheat sheet only covers a sampling of the classic albums that incorporated the break; and an accompanying playlist spans some of the famous songs built around it. It includes a review of Above the Law’s Livin’ Like Hustlas as a tribute to rapper Kevin “KMG” Gulley, who passed in early July. Rest in peace.